Thomas Green is an Australian comic based in the UK. An engaging story-teller, and known for his face of elasticity and highly energetic stage presence, Green has been selling out festival shows since 2012. Green’s quick-witted exchanges and improvisation with audience members are truly impressive, clever and natural. ???? (The Advertiser, 2012). 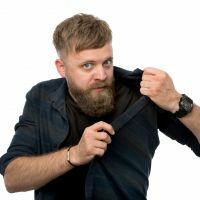 His effervescent charisma and hilarious characterisations led to his nomination at the Adelaide Fringe Awards, leading to sold out shows at both the Melbourne International Comedy Festival and the Edinburgh Fringe Festival - ‘he’s proof you dont need a gimmick to be great. ???? (The List, 2016).